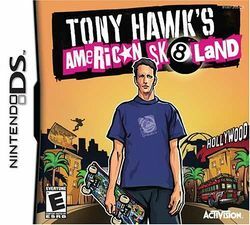 Tony bursts onto DS and GBA with cel-shaded graphics just like his home console offering Tony Hawk's American Wasteland. The DS version includes online play and this game is really molded around one Tony Hawks community. It is one of the first games (alongside Mario Kart DS) to use the Nintendo Wi-Fi Connection. The main aim is to recreate the wonderful atmosphere of the "American Sk8land" skate park. One of the first skate parks ever to open in America where lots of top skaters use to hang out like Paul Rodriguez and Tony Hawk. You and Mindy (local skate chic) try to repair the park. You do tricks in front of the locals of towns and cities around America and collect money. With that money you can purchase skate parts like grinding poles, ramps etc. You even get to win one at the Vans skateboarding tournament. Along the way you meet up with lots of legendary skaters who teach you new tricks and hep the park. But when the owner of the park wants to sell the park for a new shopping centre (mall) you decide to make a video with all the great skaters, you doing all the suicidal tricks. The video sells, the skate park is happy. And Mindy gets her drawings and articles published worldwide in a skating magazine. Other modes include "Classic" and "Free". The game is also notable for being one of the first DS games to have songs as its jukebox instead of just music. You can also customize your board and spray graffiti, customizing is a big part of the game and is made easy with the stylus. Finally high scores can be uploaded to the Tony Hawks: American Sk8land website and goals can be downloaded for Classic mode. This page was last edited on 14 March 2012, at 10:43. This page has been accessed 17,282 times.